Consuming seafood is an important part of a balanced diet. The U.S. Department of Agriculture's Dietary Guidelines for Americans 2010 recommends eating 8 ounces of fish per week, although this number varies by age, gender and fitness level. The U.S. Environmental Protection Agency advises that women who are pregnant or nursing consume fish lower in mercury, like salmon, rather than fish that may contain higher levels and be harmful to child development. A serving of salmon is 2 to 3 ounces. A salmon steak is usually between 4 and 6 ounces, or about two servings. Like other fish, salmon contains protein. According to the USDA, women should get about 5 ounces of protein daily; men, 6 ounces; and children, 2 to 5 ounces, depending on age. 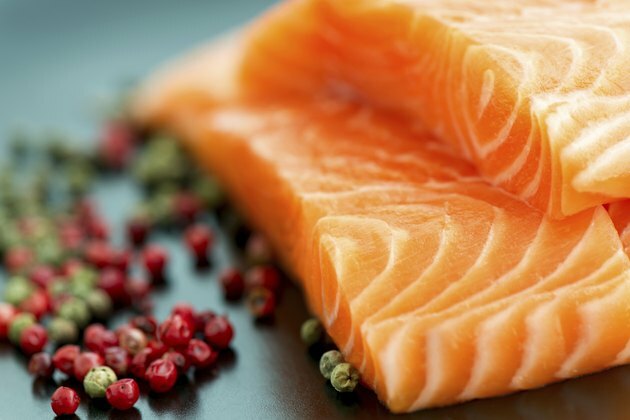 Salmon is high in Omega-3 fatty acids, which are good for your heart. It is also high in vitamin D. Consuming 8 ounces of fish per week can lower your risk of heart disease, reports the American Heart Association. A 3-ounce serving of fish is about the size of a checkbook. The most accurate way to measure a serving of salmon is to use a kitchen scale, however. In the grocery store, you can usually find already-portioned salmon in the freezer section. In the meat/seafood section, you can find the weight of the package on the label and then cut it into the correct portions. If your market has a fish counter, ask for a specific weight of salmon; that way, you know exactly how much you're getting. American Heart Association: What Is a Serving?